Today my family and I found ourselves at Bonifacio High Street to have lunch with my family. It’s my treat because I just got paid, but since we’re all following certain diets, we didn’t have to eat in an expensive place. But that’s not the point. Going to Bonifacio High Street meant I could drop by the huge Fully Booked there and look for the books that I couldn’t find in Fully Booked in Eastwood. I swear, being in that branch of Fully Booked makes me giddy all over. I mean, five floors of books (including the basement) and other things? Heaven. Plus I’m sure to find the books I’ve been looking for there. I was supposed to accompany my mom to the comfort room first before roaming around but I got distracted by the books at the Young Adult section on the second floor — and there I go. Sorry Mom. Ever since I saw the movie trailer of Percy Jackson and the Lightning Thief when I watched Avatar before Christmas, and after I’ve read Myk‘s review of the Percy Jackson series in his 2009 year-ender post about books, I was super curious about this book. Of course, as luck would have it, I could not find a copy of the first book anywhere near me. All I could see were copies of books 2-5, and book 5 is in hardcover, too. I was sort of glad that I finally found a copy of the first book in High Street. Sort of only, because I’m not too keen on movie covers. I want the old cover…but this would have to do for now. I could always find one next time…when I have extra budget. Or ask for a boxed set for my birthday. 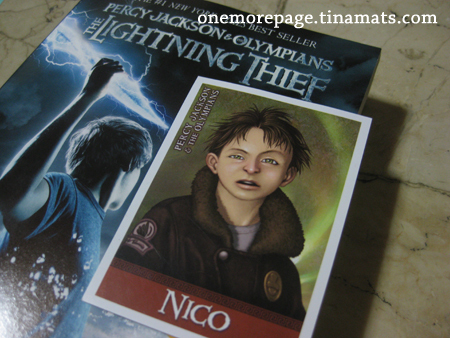 I don't know who you are Nico, but you'll be a bookmark for now. I went home with not much damage on the wallet — any book that costs less than Php 300 for me is kind of cheap for me already, especially if I bought it in a bookstore. Plus I have a 5% discount for using my HSBC card, so it wasn’t that bad. There was another book that I really wanted to buy earlier: The Forest of Hands and Teeth by Carrie Ryan (thanks to Adele again for her review on this). The title is kind of morbid, don’t you think? But come on: it’s young adult fantasy…with zombies! Who wouldn’t want that? ;) Anyway, I wanted to buy it, but the paperback version is not available here yet — strange because it’s already out in the US. 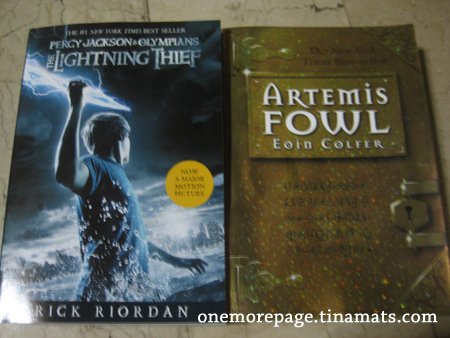 I could buy the hardcover one, but if I would, I’d rather buy it in Eastwood after two weeks, at 20% off too. But…let’s see. I can wait…it’s not like I’m going to read it immediately anyway.